Life After I "Dew": GAME DAY! 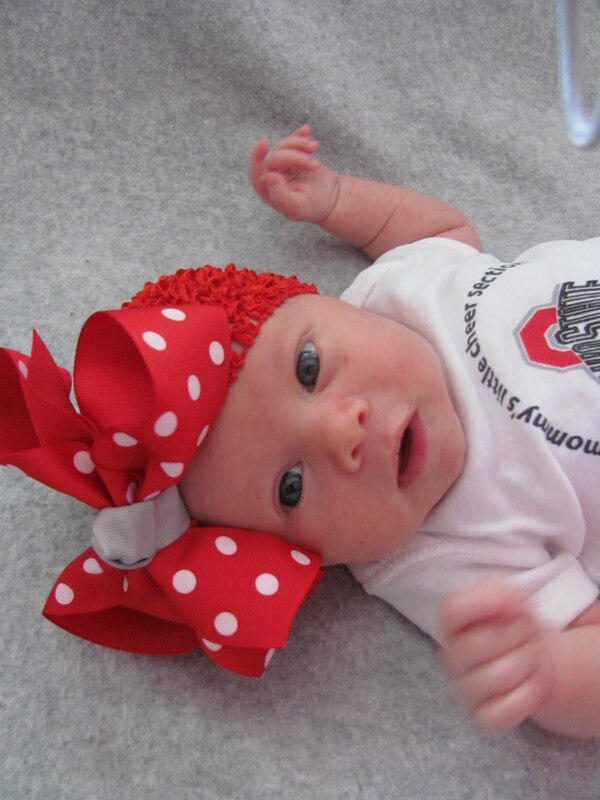 It's the FIRST Ohio State game tonight and we couldn't be more pumped up! Kendall is bringing her team spirit! O-H! So cute! She's a doll! Great minds think alike! 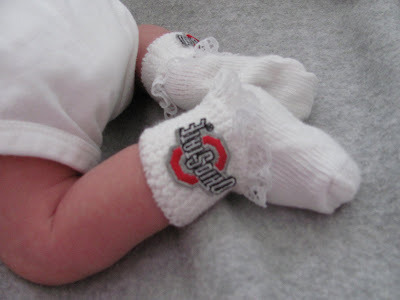 I just got Jamie all decked out for his first Buckeye game too! Of course he was half alseep for his photo shoot so I'm going to have to try and get some better ones later....perhaps with his eyes open! So cute! I love her onesie! I love it!! I have friends that play Lacrosse out there! Great school! I hope the team did well for KP's first game! Oh my gosh, I think I just squeeled a little. I love her outfit. GO BUCKS!!! 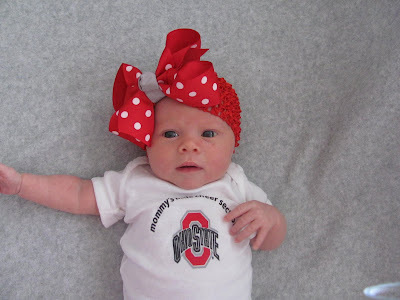 Ohhh I don't like Ohio State but KP is so cute I could almost make me a fan! My hubby and I are big USC fans - I can't wait to get our future children decked out in USC gear. Awesome! 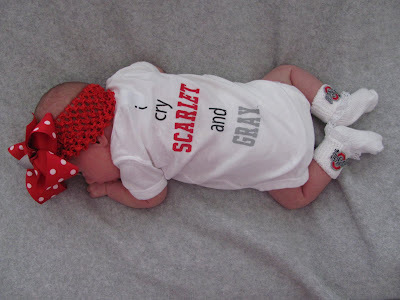 and she looks so adorable in her scarlet and gray swag! Cute cute cute! HOW SUPER ADORABLE!!! 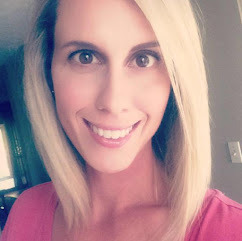 She is a such a doll, Shannon!!! :0) LOVE the onesie! Your college team is playing my college team tonight!! OMG! So cute! That's gonna be my future kid, except in Patriots gear. And BU Terrier gear. I-O!! She is so adorable!!! She is so cute! 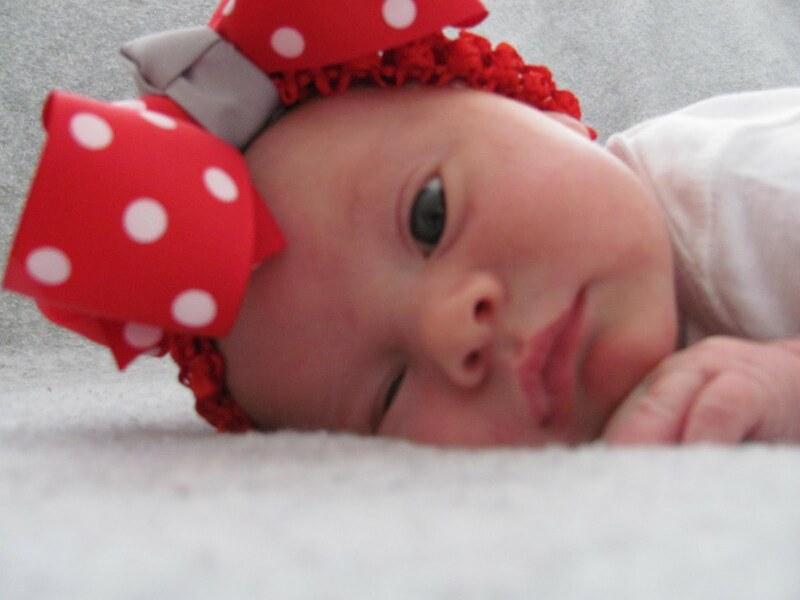 I love the little bow/hat...where is that from?!?! Also love the new layout!